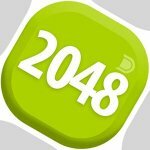 the Purpose of game 2048 Merge consists in gathering of a treasured cube with number 2048. Solve the given puzzle correct statement of cubes in the necessary places. When 2 and more cubes with identical number settle down nearby, they merge in one and the number is multiplied twice.